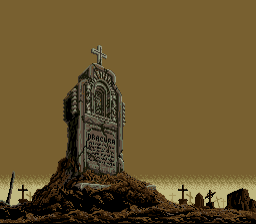 Thanks to RedGuy’s work on his Super Castlevania IV Editor, SC4 now has most of its assets in an uncompressed format, making it possible to do all sort of hacking feats on both SCIV and Akumajou Dracula. All of the crosses in both backgrounds, coffins, gravestones, etc have been restored. The green goop has been ditched in favor of the blood in level 8-1-1 and 8-1-2. 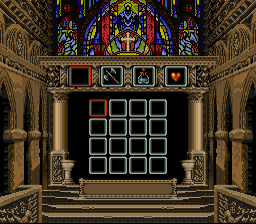 The Stained Glass from the Continue screen has been restored to its Japanese counterpart sprites. 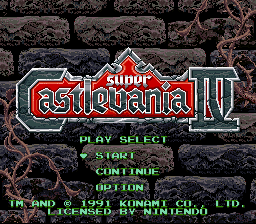 The Font has been modified to match that of the Japanese release as well. 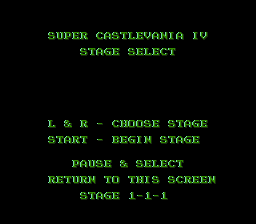 The Stage Select screen has been completely reworked and translated. Note: A similar patch by DarkSamus993 will be released as an upcoming update for the Japanese version of the game. The “Things to do” will most likely be added to the Japanese ROM hack instead of the US ROM. 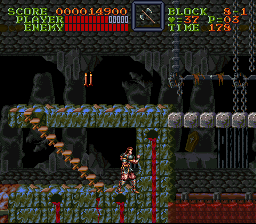 Also, he might update the English patch to add the Blood drop to the English version of the ROM. Keep an eye for the update! I love the uncensored graphics changes, but unfortunately it is cancelled out by the the ugly text change. The text change should be an optional/separate patch. UPDATE: The Mod Author added an optional text patch to revert it back to the way it should look and it is glorious. Now you can have the uncensored graphics with the proper text.